Calling all Fulton Schools faculty and industry engineering and design professionals! The EPICS Design Reviews are fast approaching, and we are in need of Industry reviewers for the following days to help our student teams take their projects to the next level! Can’t make it this time around? Please forward this information on to your colleagues or friends in industry. We are always looking for more reviewers! 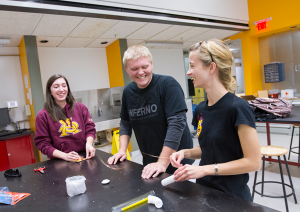 The Engineering Projects in Community Service program provides students the opportunity to practice applicable engineering design concepts to solve engineering-related problems for non-profit organizations. As a reviewer, you can offer the students useful feedback concerning the development of their projects. Please check out the registration form for additional day and time opportunities to be a design reviewer. These students are learning the fundamentals of the design process and working with community partners for the first time in order to engineer, prototype and build solutions using human-centered design. Complimentary dinner and refreshments will be provided for all reviews. Please provide all dietary accommodation information on the sign-up. Tempe – Dinner will be served at 4:30 p.m. and a brief training for judges begins at 5 p.m. If leaving work is a challenge, you can arrive as late as 5 p.m.
Poly – Box lunches will be served. Please provide all dietary accommodation information when signing up.